Boxers or Briefs? It's anybody's guess! If you're looking for a fun way to find out all kinds of things about your friends, try bringing the Boxers or Briefs game to your next get together. 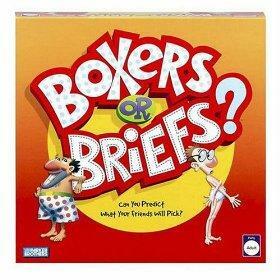 What is the Boxers or Briefs Game? You might not care what kind of undies your buddies wear, but wouldn't you like to know about some of their most unusual habits or interesting experiences? That's exactly what you'll find out when you play the Boxers or Briefs game with your friends. Contrary to what the name implies, this game really has nothing to do with underwear. This hilarious, modern party game for grown-ups is an entertaining question and answer game that can provide hours of enjoyment and laughter. Introduced by Hasbro in 2006, this game has become one of the most popular board games for adults. Each player takes turns in the hot seat, while the other players draw cards and select wild and wacky statements that supposedly describe the lucky person in the spotlight. Players select two cards, one which accurately describes the person, and one that is just something funny. The player being described has to read each statement aloud as if it were true. When you're in the hot seat, you may find yourself declaring all types of hilarious things about yourself, ranging from true statements to ridiculous assertions. Everything you need to play is included with the game set, which is affordably priced at less than twenty dollars. It's designed to be played with groups of four to ten people, which makes it a perfect party game. You can play the Boxers or Briefs game anywhere. Because everything you need is stored in a single box, the game is easily transportable. It's fun to take along on camping trips or weekend getaways. When you play this game, be prepared to laugh until your sides hurt. It can go on for hours, as there are over 2,000 funny phrases available, and you never know where a comment might lead. Even though the game is labeled as being intended for players age 13 and up, it's important to keep in mind that the content of the game is likely to vary widely based on the composition of the group. In some cases, the game is quite tame and family friendly, but in others the tone can become very racy. There is no reason that party games have to be limited to kids. Grown-up parties don't have to be sedate and boring. You'll have a great time playing Boxers or Briefs with your friends. No matter how long you've known them, you're likely to learn some new things about the people in your circle of friends when you bring this terrific party game to your next social event. Boxers or Briefs is a fun group game. Compatibility Game: This is another great party game that gives adult players a chance to get to know their friends a whole lot better. Dirty Minds: This hilarious guessing game for grown-ups is surprisingly clean, but can help you figure out which of your friends have the dirtiest minds. Man Laws and Woman Rules: This game takes a funny look at those things society sees as uniquely male and uniquely female. Discover why men and women don't always see eye to eye, and why they find each other's quirks so entertaining.